Houthi forces has said they cut on Thursday four land routes providing supplies for Joint Forces backed by the Saudi-led military coalition with whom they are engaged in fierce battles over control of the western port city of Hodeida since last Friday. 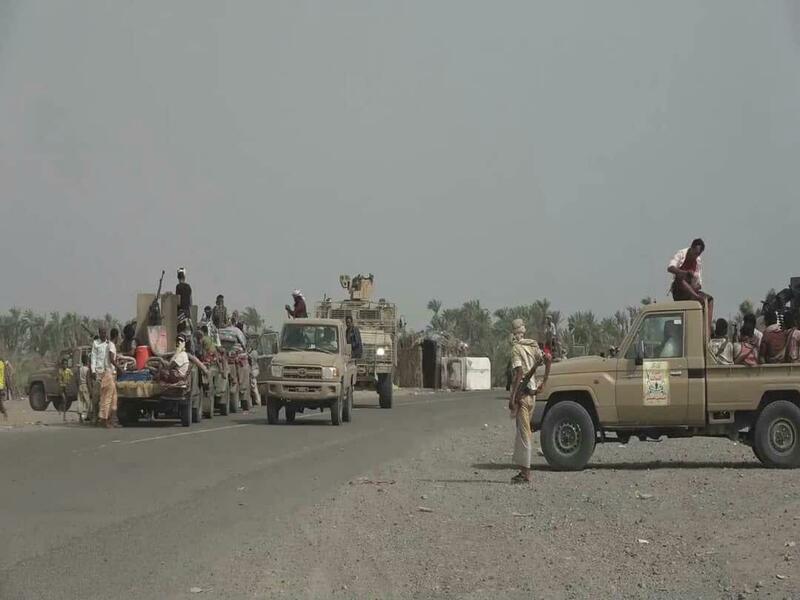 "The first and forth routes were in Attahita District, some 40 KMs to the south of Hodeida City," said Houthi (Ansarullah) Group in a statement seen by Debriefer. "The second was in al-Faza area and the third in al-Jah area. "The offensive confused enemy forces, ravaged 17 vehicles and left no less than 150 killed or injured" of JF troops. The statement claimed that clashes, since last Friday, left more than 1000 killed or wounded, including leaders, and more than 150 vehicles destroyed. "Houthi troops called, via microphones, on mercenaries to surrender at determined points, and welcomed Hodeida people supporting them," according to the statement. Houthi-appointed Hodeida governor, Mohammed Iash, and his deputy paid a visit on Thursday to al-Thawra Hospital, to the south of the City, in the nearby of which smashes have been raged for three days. According to media sources, the hospital's vice-chairman briefed the governor on difficulties hindering work at the largest health unit in Hodeida, as a number of doctors fled fighting. On their part, Joint Forces said on Thursday they started getting deeper into eastern and southern quarters of Hodeida City, an omen of looming bloody street battles. JF sources said their troops fighting Houthis on the southwestern coastal road, around Hodeida University and near al-Thawra Hospital. The Yemeni Joint Forces (JF) were formed of three military divisions, most notably Amaliqa (giants) brigades, all elements of which are from south Yemen, forces led by Tariq Saleh, nephew of late president Saleh, or the so-called 'National Resistance', and the Yemeni Government-led Tehama Resistance, forces of which are from the western coast. All the JF units are mainly backed by the United Arab Emirates, the key partner in the Saudi-led Arab coalition supporting legitimacy in Yemen and intervened militarily in the country in March 2015 to reinstall Hadi. Amaliqa-run Information Center claimed on Thursday that JF forces, supported by coalition fighter jets, advanced in some Hodeida neighborhoods, namely near 22-May Hospital and grocery market where they fiercely engaged with Houthi troops and "inflicted them heavy losses in lives and weaponry." Website run by the armed forces loyal to the internationally recognized Yemeni government stated Thursday that violent fighting was raged in the afternoon on Sana'a Street leading to Hodeida downtown, where "Houthi ground leaders left their militias behind." According to eyewitnesses and locals, Houthis on Thursday removed their large propaganda postures and leaders' pictures from main streets of Sana'a City. Witnesses told Debriefer that they "were surprised by disappearance of pictures of the Houthi late leader Saleh Samad," who was killed in Hodeida by Arab coalition airstrike last April. The pictures used to be "hanged on many corners of 70-meter parade road." Observers associated the removal to the tearing and scratching of Houthi pictures and postures on streets recently controlled by JF troops in Hodeida. Fighting intensified anew in Hodeida, following calls of the US and other countries to stop war within one month, as the Arab Saudi-led coalition and joint forces declared on Friday the launch of new military operation called "Freeing Hodeida". The conflict in Yemen has left nearly 16,000 people dead, hundreds of thousands injured, 3 million displaced and made other thousands to flee the country that is facing the world's worst humanitarian crisis, according to the UN.